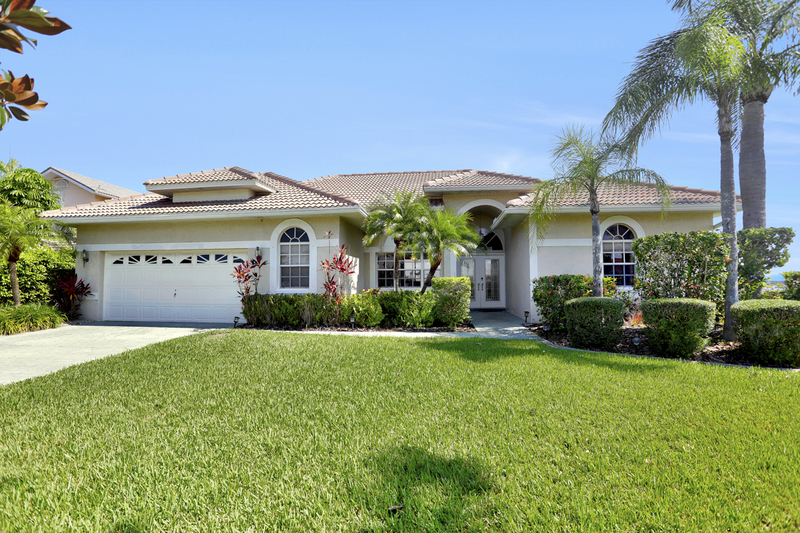 Situated close to Tarpon Point in the very popular 8 Lakes district of Southwest Cape Coral. 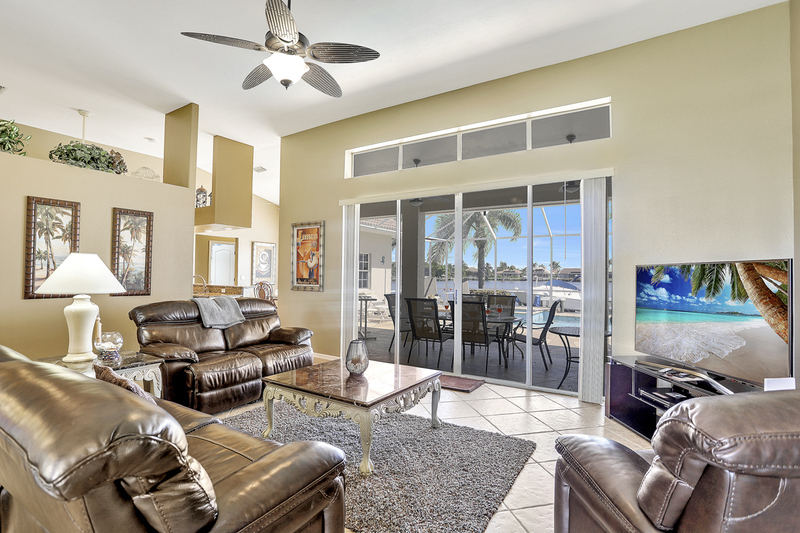 This spacious home is a great choice for guests seeking breathtaking views and a convenient location. 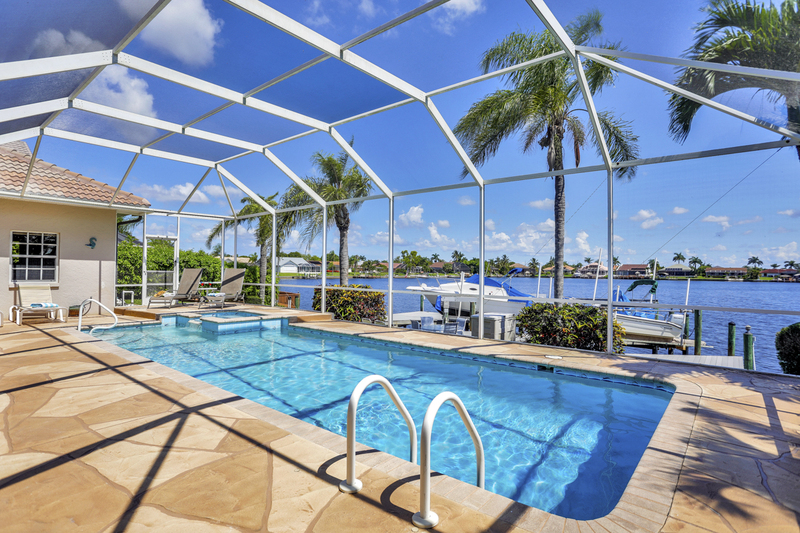 Featuring 3 bedrooms and 2 bathrooms and an over-sized electrically heated pool and spa. 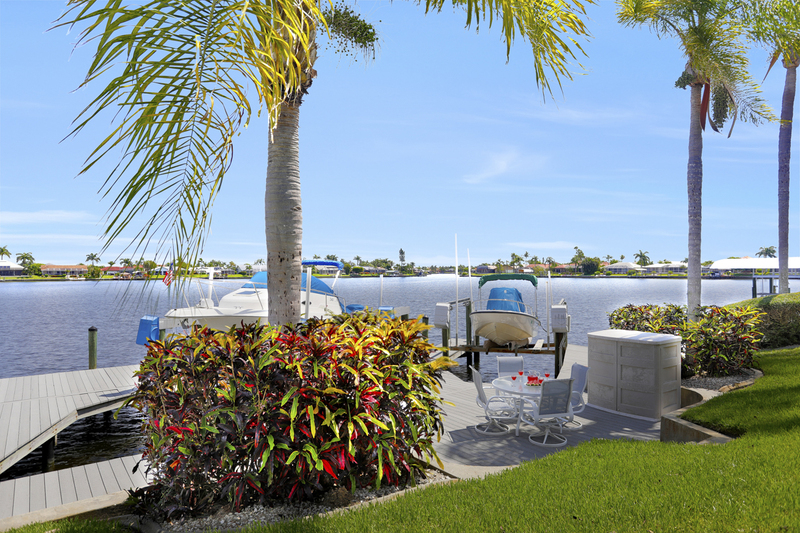 Here guests can enjoy the waterfront large private dock and do a spot of fishing or sip a cold drink and watch the sun set on another perfect day in Florida. I truly enjoyed my stay at Villa Laguna and working with Churchill Property has always been a pleasure. Always receive fast reply to any email that I send. Most helpful in making my stay the best vacation ever. I have stayed at several locations and the only problem was the Villa Laguna doesn't have full use of the garage . The area and the home was everything promised and more. I wouldn't hesitate to recommend staying here, the view was breathtaking. so serene . In June, we stayed at Villa Laguna. This was our third stay at this lovely home. We have only good things to say....the house is spotlessly clean and has all the necessities in the kitchen. The décor is lovely and comfortable. The pool gets a lot of use during our stays and we love being able to look out over the lagoon and watch the stunning sunsets. 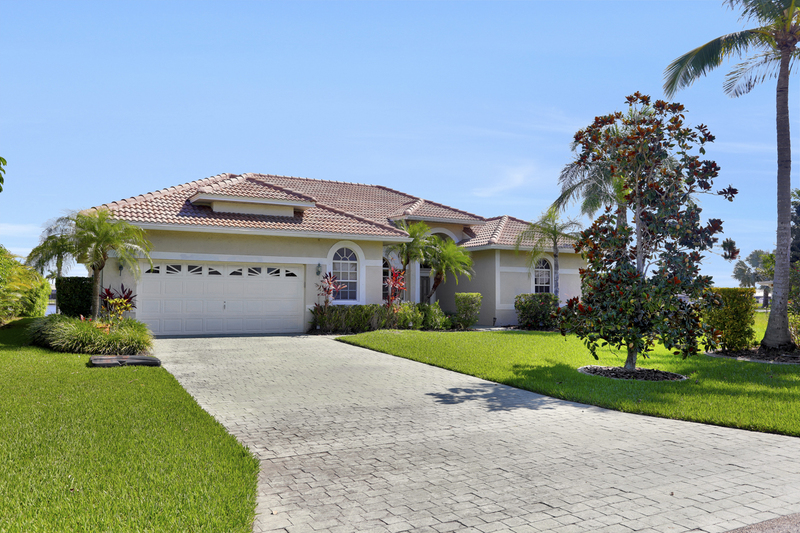 The house is in a location that provides easy access to Cape Coral, Fort Myers, Sanibel and Captiva, and to the north-south highway to travel out of town (and the airport). The neighbourhood is quiet and residential and, with the vacant lot on one side, is very private and peaceful. The layout of the house is such that the master bedroom and bath are on one side and the other two bedrooms and bath are on the other side with the kitchen, dining room, and living area between. 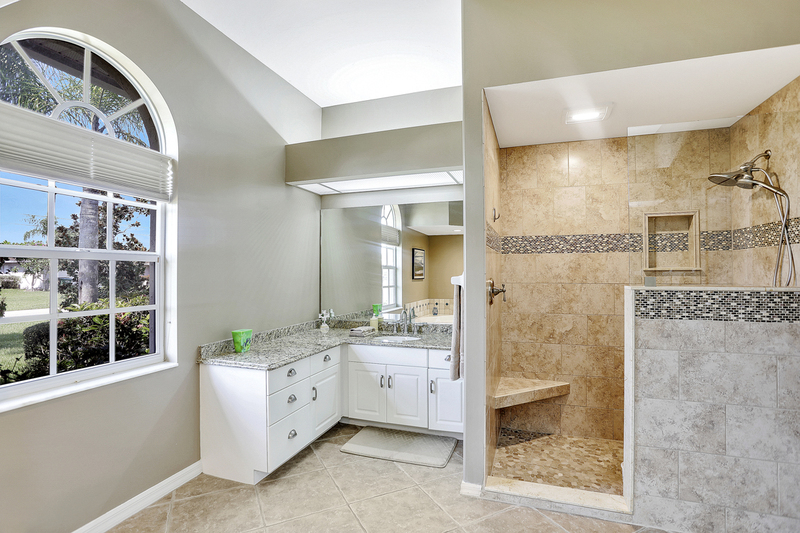 This makes it ideal for two couples to share as both would have some privacy. Whenever we need an R&R vacation, this is the place for us! It's an added bonus that the folks at Churchill Properties are so easy and pleasant to deal with. We're already looking forward to our next visit to Villa Laguna! We enjoyed our stay at Villa Laguna. The house was very well furnished, inside and out. 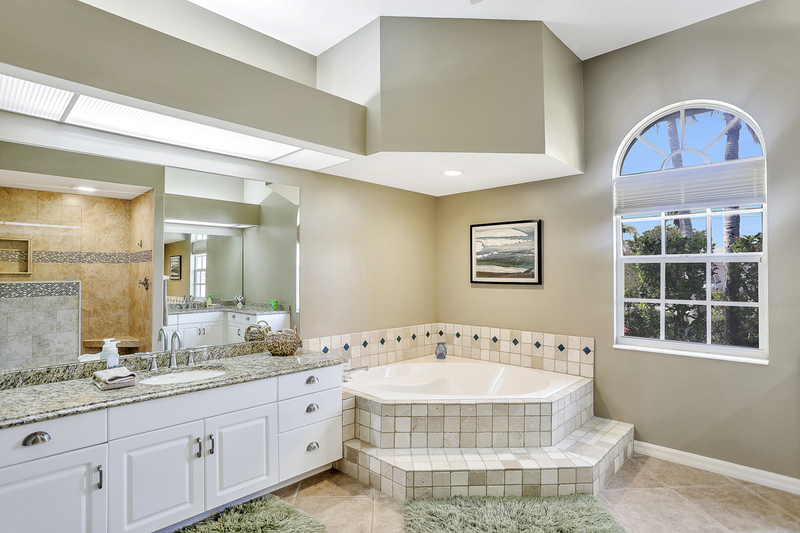 The master bedroom was large and comfortable, and the two separate sink areas in the master bath were nice to have. The vanities are a bit low for me, being 6' 2" tall. The pool was great, and we used the gas grill extensively. There is a terrific view of the lake from almost all the rooms. I tried some fishing off the dock just a short while, without success, but a couple of young guys fishing next door said they have caught a large variety of fish there.The house is very conveniently located, with quick access to Cape Coral Parkway, but being by the lake made it seem like we were nowhere near all of that. The area is very quiet, and the neighbors we met were quite friendly. 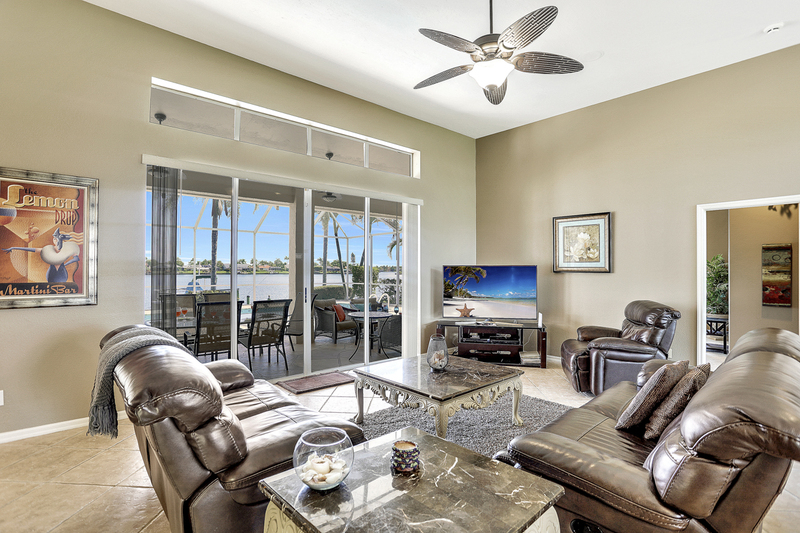 There were some beach chairs and a small beach umbrella that we made use of on beach visits.This was our third extended stay in Cape Coral, our first in a Churchill property. We were very impressed with them. There was a rather essential floor outlet that was not working. I called the managers and they sent an electrician to fix it. The mailbox post snapped off for some reason. They sent someone to fix it the next day. I mentioned that there weren't enough sharp knives in the kitchen. They bought a nice new set and delivered them the same day. Pretty good service. Even the pool cleaner was great, taking time to answer my questions about the pool heating system.Every place has negatives. 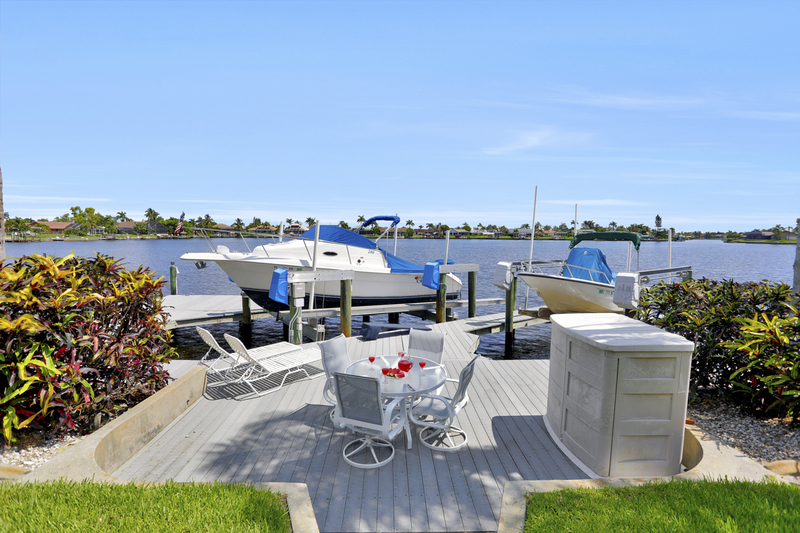 The owner had his boat on one of the lifts, which blocked a bit of the view from the dockside patio. I understand that usually both lifts have boats on them. He also had his van parked in the double garage, so it was a bit tight getting in and out of our rental sedan in the garage. We are boaters, and we rented a boat to keep at the property. It's a very long and slow ride to the Gulf from the house. It's all canals and river slow zones. So if you will be boating, understand a lot of time will be spent going slow. It's fun to look at all the houses, boats and occasional dolphin along the way the first couple of times, but then it becomes very time consuming. There were a couple of bicycles in the garage, but they were not well maintained. I tuned them up so the brakes and gears worked and the bolts were tight. The TV in the living room is very large, and was once state of the art, but it's a projection type and not HD quality. It could use an upgrade.To sum up, the house was great and well located for car travel, not so great for boat travel. We would definitely rent with Churchill again if they have an available property closer to the river that would otherwise suit our needs. They are good people to deal with. Really enjoyed our stay. We found the property to be exactly as listed. 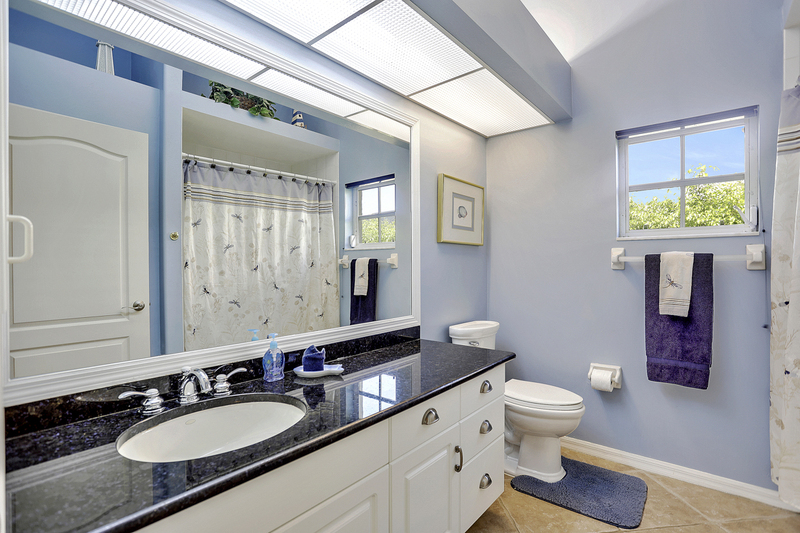 It was very clean and maintained to a very high standard. We booked through Churchill Property Services and they were very helpful in all aspects of our booking including a slightly earlier check in on our day of arrival. We would certainly stay at the property again and would have no hesitation in recommending a stay here. 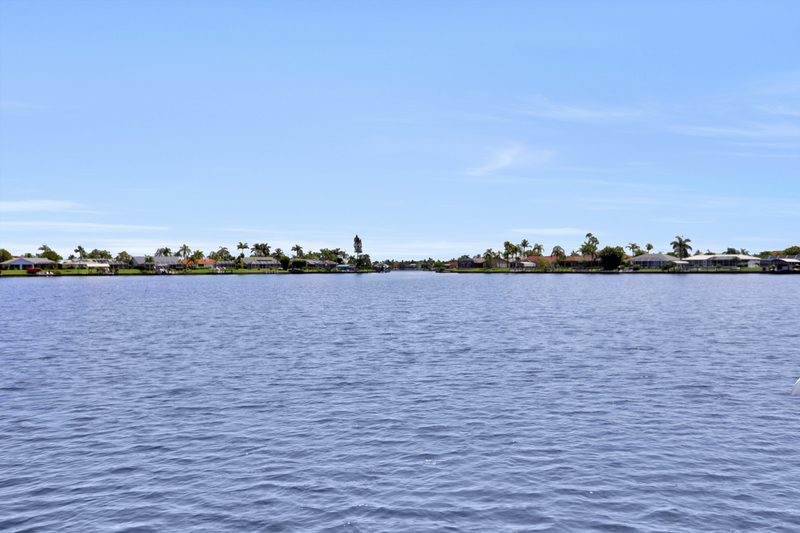 We had a great trip to Cape Coral. The house was great and everything was clean. The house was stocked with everything we needed. The owner of the property management company, Neil, was exceptional! He addressed all minor issues promptly and responded right away to our questions. We would definitely recommend the Villa Laguna property to others! 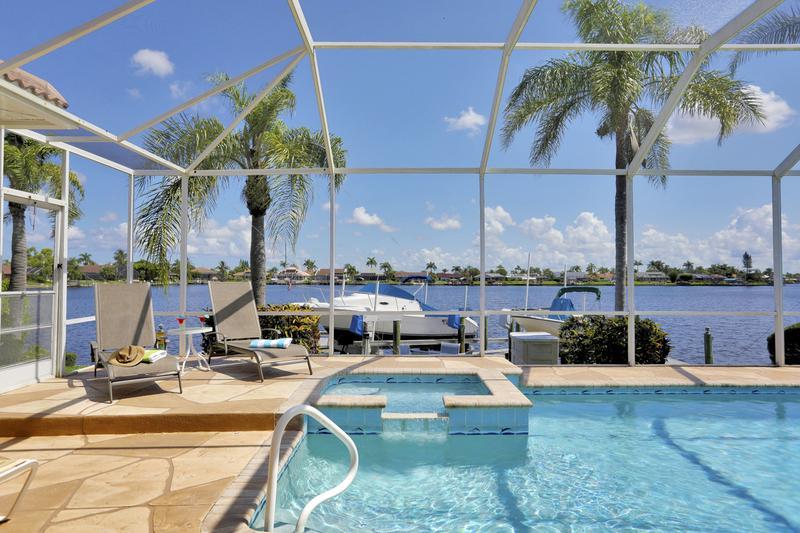 Thank you for sharing your home, with its beautiful water views, with our family! We really enjoyed our six night stay. 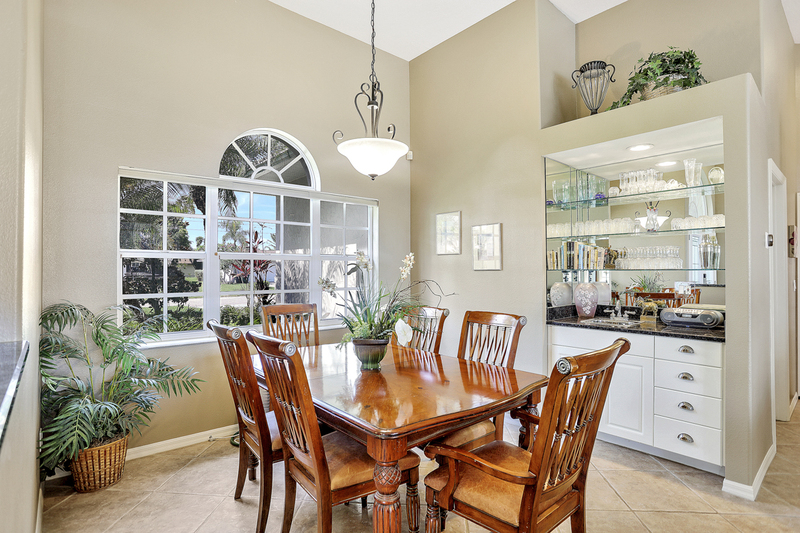 This luxurious property was clean and well maintained. The kitchen was superbly equipped, with everything we needed to fix all our meals. 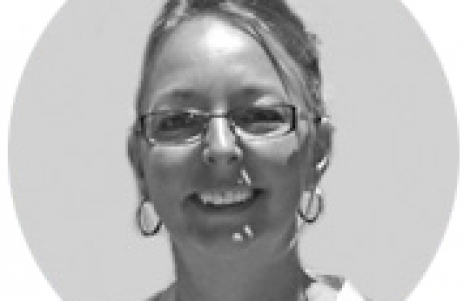 (We only ate out occasionally on day trips to Pine Island and Sanibel Island). We especially enjoyed the pool, the hot tub, and the view over the water. I would definitely recommend Villa Laguna and we hope to return. Really enjoyed the house, it was clean and well equipped with everything that you needed. Pool and spa was really relaxing. 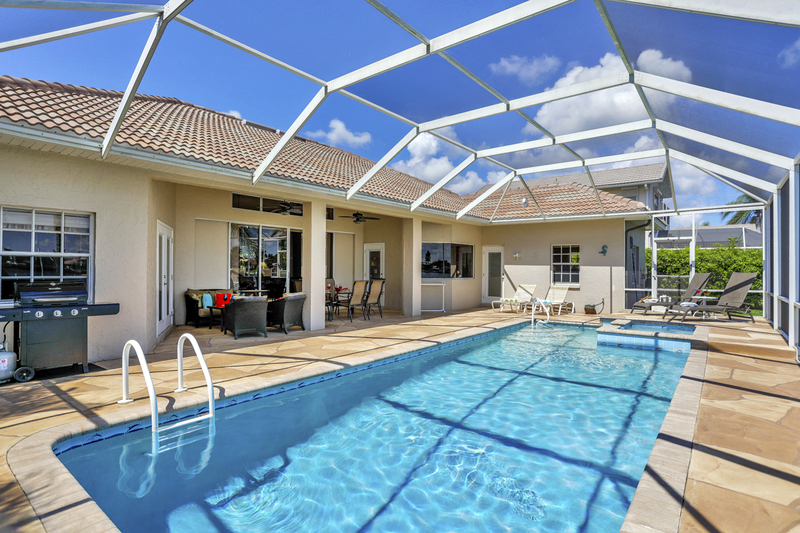 We enjoyed our stay at the Villa Laguna in Cape Coral big time! 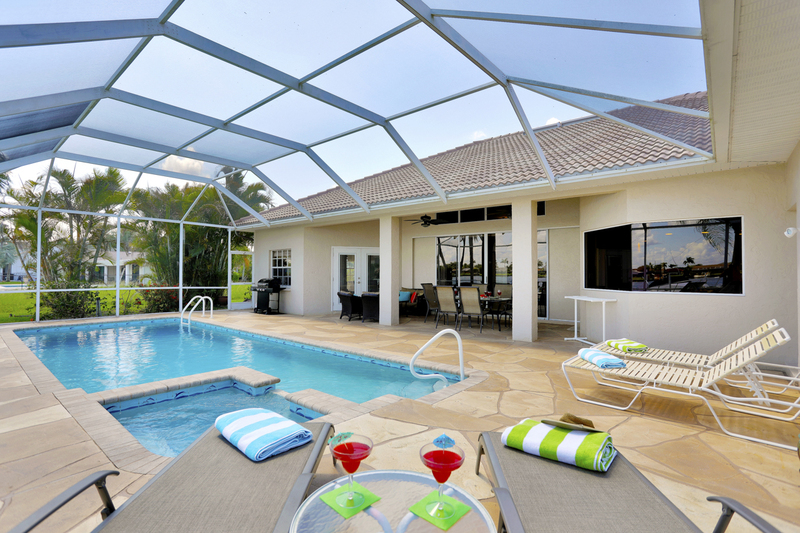 Very nice place to relax and take it easy, in a villa with all amenities available. Modern open plan kitchen with granite worktops, overlooking Breakfast Nook & pool. 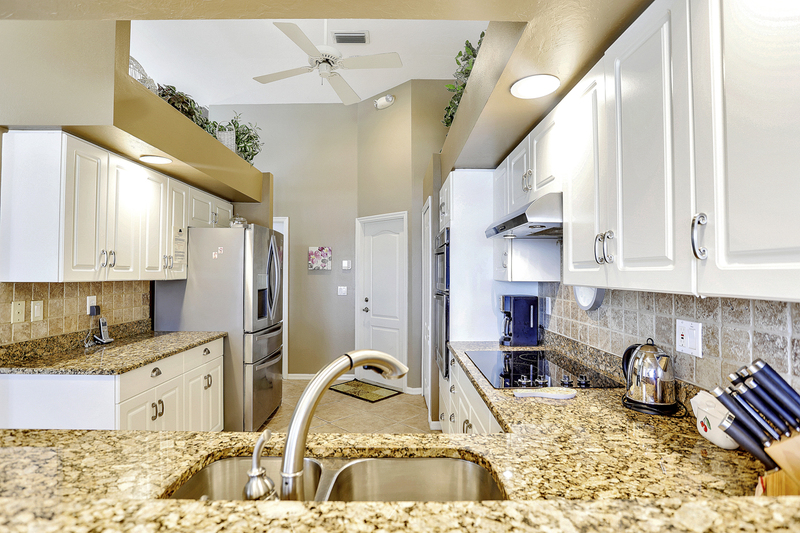 Equipped with all appliances & cooking utensils. Also Gas BBQ in lanai area for al-fresco cooking in the sun! 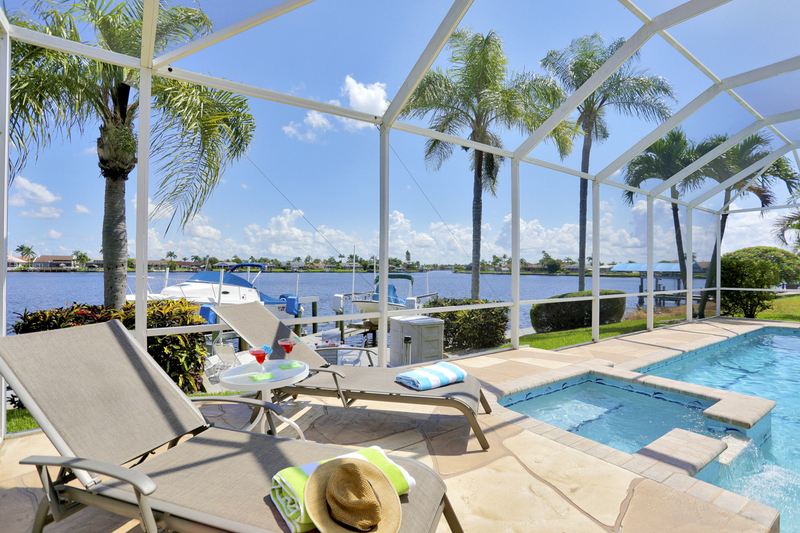 Villa Laguna is a gorgeous waterfront residence, ideal for guests looking for a convenient location and comfort. 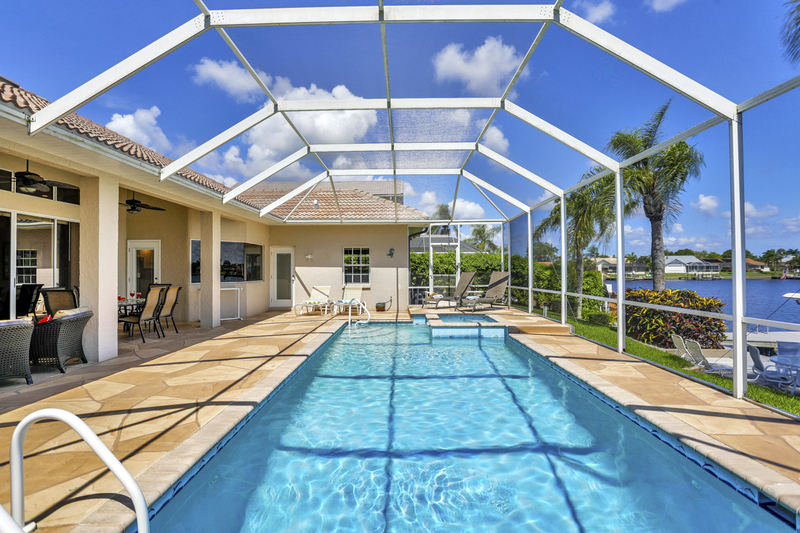 This upscale villa is located in the 8 Lakes district just south of popular Cape Coral Parkway and a stone's throw from the boating community of Tarpon Point. 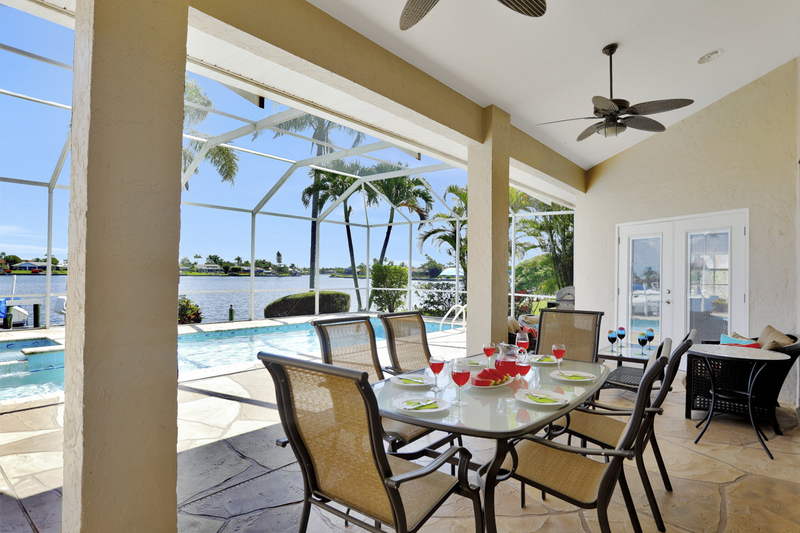 The main focus of the home is the magnificent panoramic waterfront views from the lanai area and rear of the property. 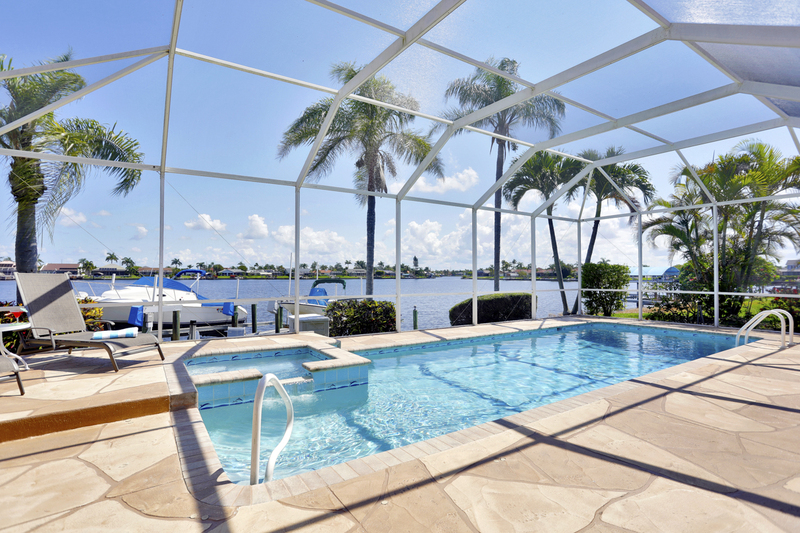 The large pool and spa area overlooks a stunning lake that is part of a chain leading to the Gulf of Mexico, known as 8 Lakes. 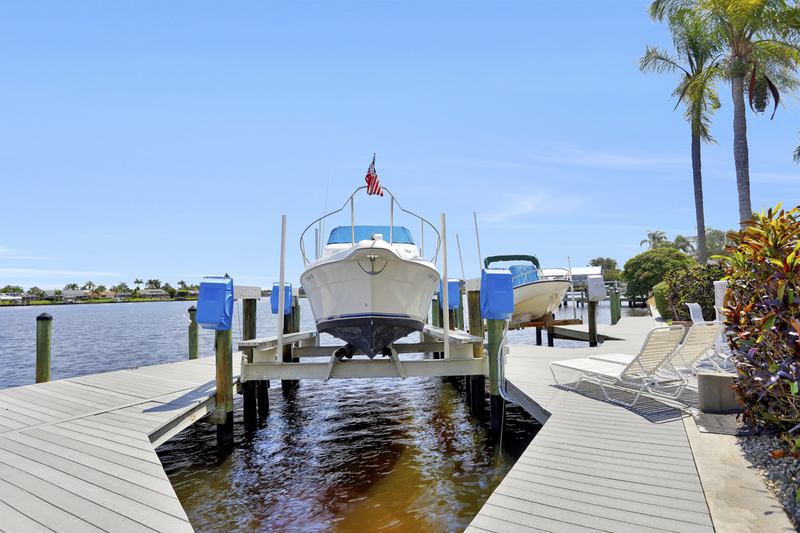 The home has the unique feature of a double boat dock which means the waterfront decking area is probably one of the largest on the lake. Here guests can enjoy the sounds of the gently lapping lake whilst trying their luck at the locals' favorite pastime - fishing! Even the most novice of anglers should enjoy some success in these well-stocked waters. 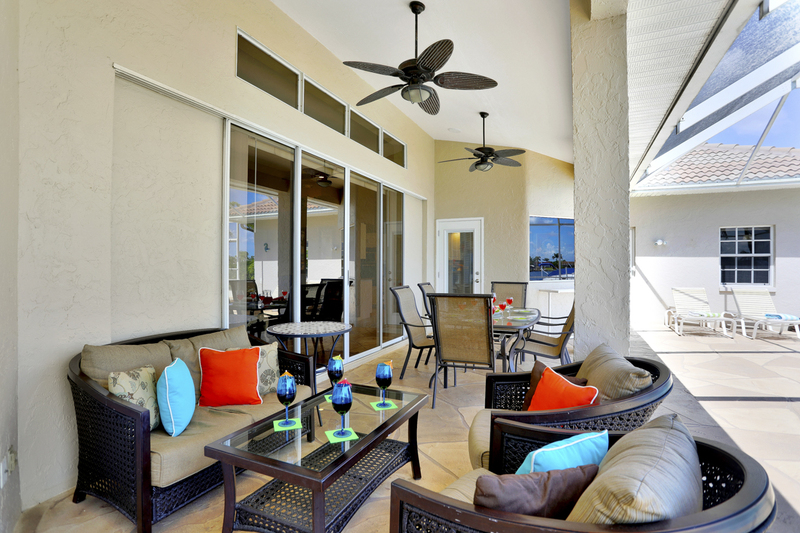 Once you step inside the home, guests will find everything they could need and every comfort catered for. 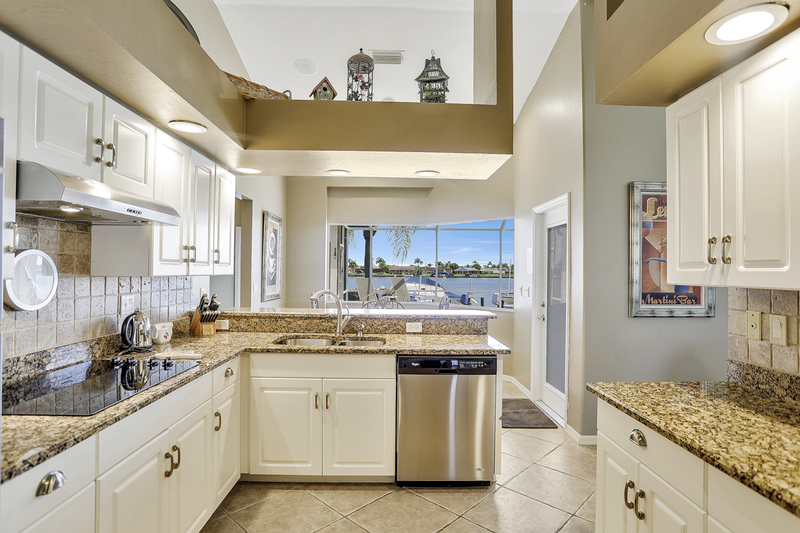 On stepping through the double-door entrance, you are instantly struck by the superb waterfront view. 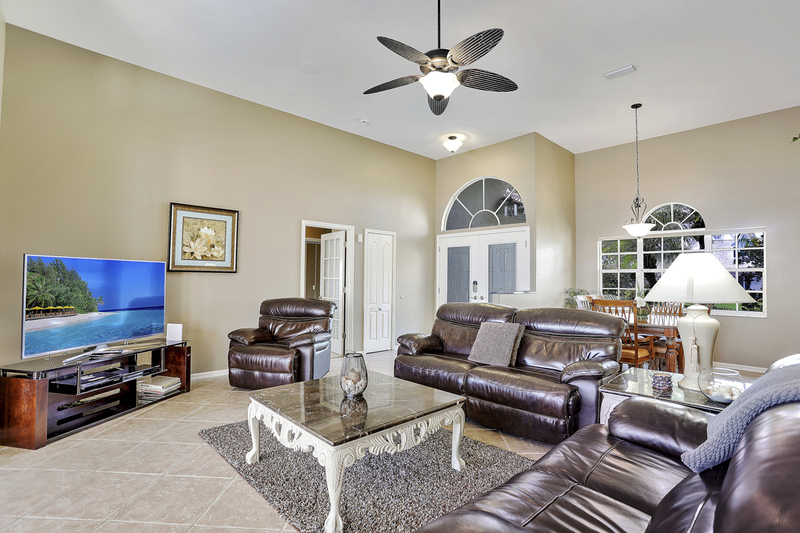 The home is open plan in style and the Family Room is the central part of the residence. 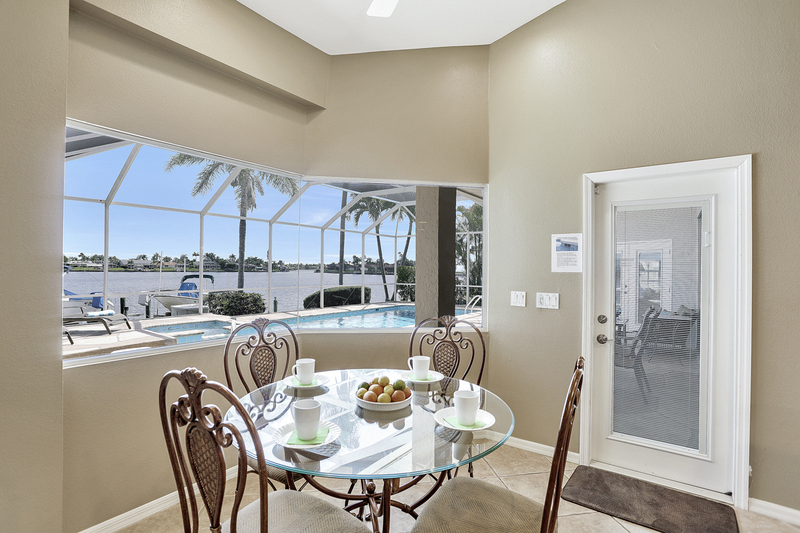 The Family Room and Kitchen area have large glass sliding doors and picture windows overlooking the pool, dock and lake. 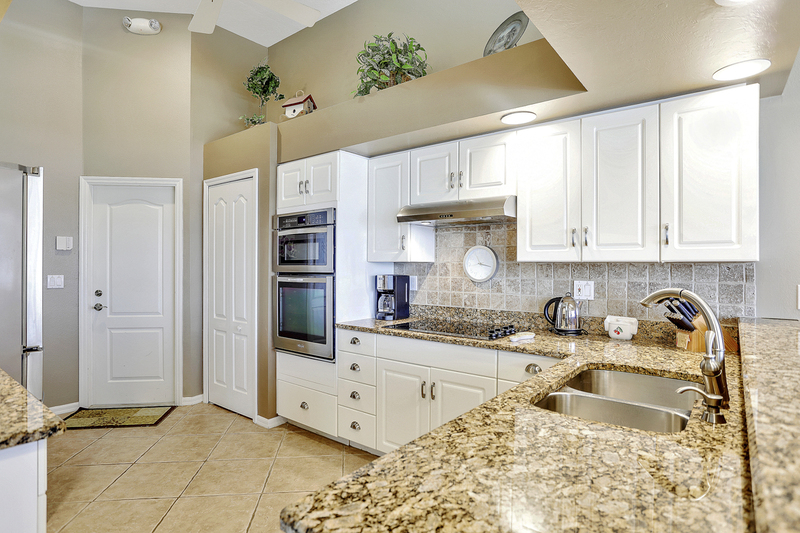 The Kitchen is upscale in style with granite worktops and tiled back splash. 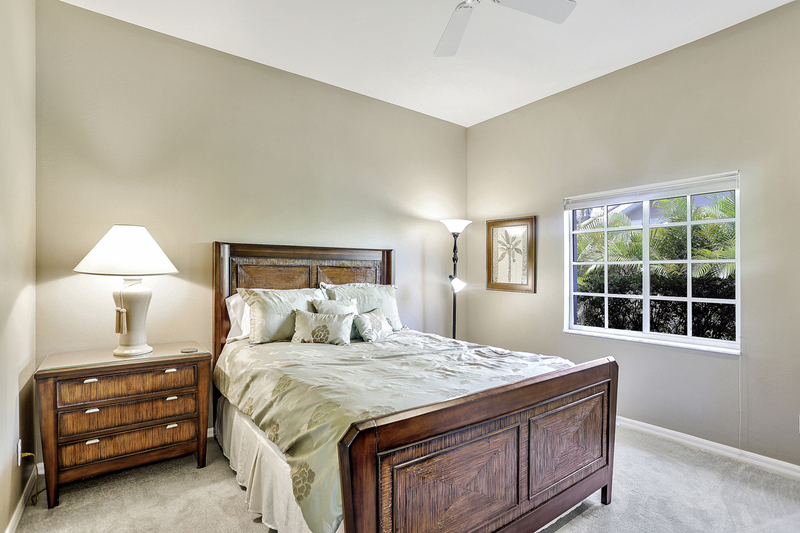 The bedroom layout is split plan with Master Suite on one side of the home and the 2 guest bedrooms on the other side for the utmost in privacy.